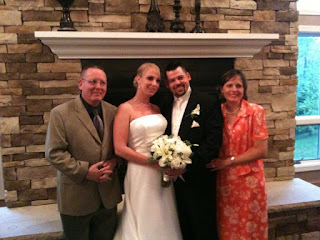 Mike and Sarah McGarvey’s wedding was held at Traditions at the Links in East Syracuse, NY, at 5:30pm on August 28, 2009. 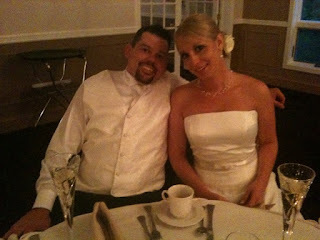 Most of the out-of-town guests stayed at the Hilton Garden Inn Hotel in East Syracuse with complimentary limousine service between the two locations provided by Mike and Sarah. While an outdoor wedding overlooking a small pond had been planned, the threat of rain caused the wedding ceremony to be moved indoors. But that did not put a damper on the enthusiasm of the wedding party or any of the guests. After the ceremony itself and the obligatory wedding photos, Kevin McGarvey, father of the groom and the Best Man, got things started off with a beautiful and heartfelt toast to the bride and groom. Click here to see a video of the toast. Kevin’s daughter, Katie (McGarvey) Ferguson – and also the Matron of Honor – had the unenviable task of following Kevin with her toast to the bride and groom. Katie proved herself equal to the task, though, delivering a beautiful toast to Mike and Sarah. Click here to see a video of Katie’s toast. All of the food and drink provided by the facility was excellent. The DJ kept the crowd on the dance floor with a good mix of music. The most memorable section of music, in this reporter’s opinion, was an extended medley of Irish music, highlighted by a song called “Golden Keyboard” by The Bofield Ceili Band, a group that played at the Mullen Family Reunion in Ballina, Ireland in 2008. While Mike and Sarah were unable to attend that reunion, playing this song at their wedding reception brought the two events together. While the wedding reception formally ended at around 11pm, the party certainly did not. A large contingent headed over to the bar at the Hilton Garden Inn and picked up where they left off. The bar was packed! Mike and Sarah joined the party after an hour or so to a loud ovation. The party finally ended at approximately 2:30am with 5 people left standing: the Mullen Brothers (Paul, Kevin & Mike) and the bride and groom! I don’t think I’ve ever seen a bride and groom close out a wedding party! Great job Sarah and Mike! The Mullen Family Tree has grown by one!! My nephew, Mike McGarvey, has just married Sarah Rector. 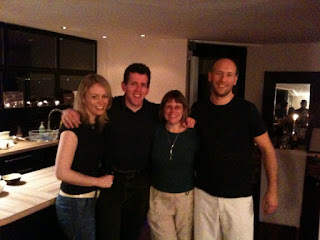 In the photo below, from left to right, are Kevin Mullen (Godfather), Sarah, Mike, and Mary (Mullen) Kinslow (Godmother). Welcome to the family, Sarah! 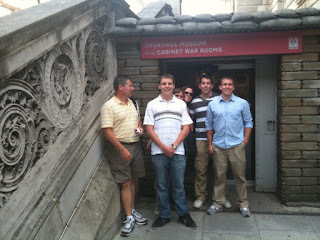 One last set of relatives to visit with before we collapsed at our hotel for the night! On the way back from visiting Madge, Marilynn and I stopped at Liverpool Street and met up with Anne Lillis and her daughters Ashling and Cliona. I had a copy of the huge Family Tree with me, so we rolled it out onto the bar table and traced out our family relationship. After proving to Ashling that we were, indeed, 3rd cousins, I made her figure out for herself what her relationship was to Avril Gilmartin. She correctly determined that they were 2nd cousins! I told Cliona that she almost certainly won the award for being the most pregnant woman at a London bar at 11pm. She looked about 8.99 months pregnant! The baby is officially due in 5 weeks, I think. I made her promise to send me an update to the Family Tree after the big event. 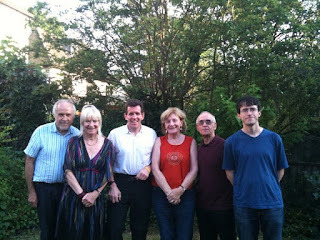 After visiting with Madge, Marilynn and I travelled to Sheila and Martin's house in Highams Park for drinks and dinner. As always, the conversation was lively, filled with politics (Obama, Cheney, Bush, Health Care) sports (relative merits of baseball vs. cricket), music (Rosalind gave me high marks for knowing the "Kings of Leon" while Sheila confessed to being a Bob Dylan groupie), film (Joseph discussed the socio-economic significance of the movie "Encino Man"). All in all, another great day! Left to right above: me, Rosalind Dore, Imelda Messenger, Sheila (Messenger) Dore, Joseph Dore, Martin Dore. 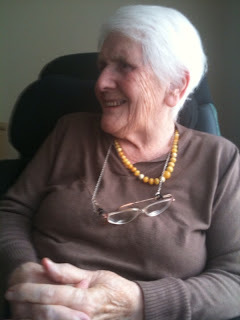 A great shot of Madge discussing her early life in Ballina and her later career as a History teacher. Vascular dementia has robbed Madge of some of her mental capabilities, but she showed sparks of her brilliance today during our visit. I understand that she recorded an oral history of the Family a number of years ago. I'll do my best to get a copy and share it with the entire Family. 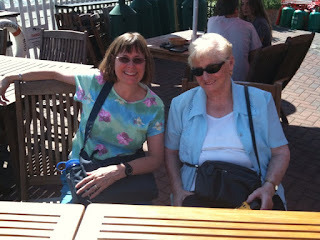 I finally got the opportunity to meet Madge Messenger in the flesh! 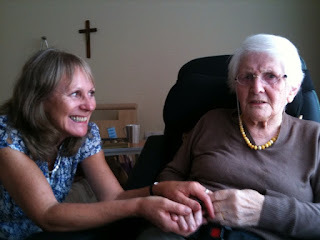 That's her daughter, Sheila (Messenger) Dore holding her hand. As I told Madge today, it's because of her dedication to the family and her amazing genealogical work on the Family Tree that last year's Family Reunion in Ireland happened. Thank you for everything, Madge!!! We ate breakfast at this place almost every single day that we were in London. The food was good, the prices were reasonable, it was 200 yards from our hotel and it had free Wi-Fi!! That's what I call a good dog deal!!!! 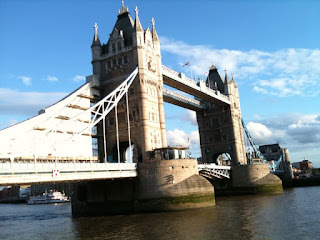 Day 8: Tower Bridge in action! Damn! If I had been a few minutes earlier I would have gotten an excellent video of the Tower Bridge drawbridge opening and closing. All I got was about the last 4 seconds of it. You'll have to look very closely. 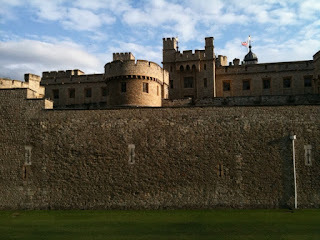 Unbelievably, we didn't go inside the Tower of London during our entire 9 day stay in England. In our defense, though, we did "The Tower" the first time we visited London back in 1986. 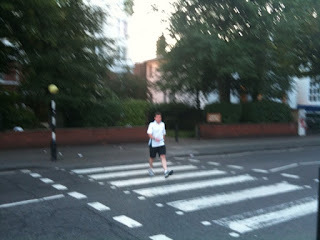 Also, we were running massively short of time. Finally, (and I really believe this), walking around the outside of the Tower of London is more impressive than touring the rooms and structures within it. I'm sure no one has ever died here, but there were a couple of spots where the metal flooring gave way slightly. It made you remember exactly where your heart was located inside your chest. The ever so slight swaying motion added to the overall effect nicely. 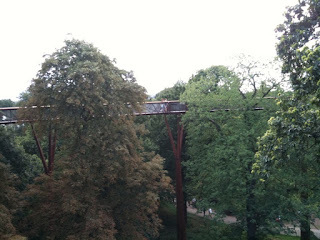 Kew Gardens was a lot better than I thought it would be. Without a doubt, though, Marilynn got more out of it than I did. I took this video just to make sure that I didn't blow the iPhone's microphone last night at the Magnetic Zeros concert. Once I took it, though, I just couldn't get rid of it. Too cute. I'm sure this video will look like trash, but it shows that we were literally right on the stage for this incredible performance. Highly highly recommended!! I'll write more later when I get more time. OK, now I have a little more time! Marilynn, Tommy Kinslow and I went to see this band knowing next to nothing about them. I had heard one or two of their songs on a Philadelphia college radio station, but I couldn't quite remember their sound. However, they were listed as "Editors Pick" for Thursday in London's "Time Out" magazine, and tickets were only 6 pounds, and there were two other bands playing, and it was a cool bar anyway, so ... we decided to go. It is almost impossible to describe these guys. I don't know a hell of a lot about them, but they seem to fashion themselves as modern day hippies. Their leader, Edward Sharpe, is more like a cult leader than a band leader. The entire band -- and the whole crowd for that matter -- gets caught up in his energy. Sharpe wasn't on the stage for more than 5 seconds when his shoes came off. A minute later, his shirt was off. He often jumped into the crowd and sang from the floor. He grabbed Tommy a couple of times and, at one point, gave him a palm to the forehead "healing gesture" of some sort. On another song, he jumped down and started dancing with Marilynn! Quite the showman. The band was great as well, playing a variety of instruments: piano, accordian, trumpet, bongos, and a variety of other drums, guitars and percussion instruments. 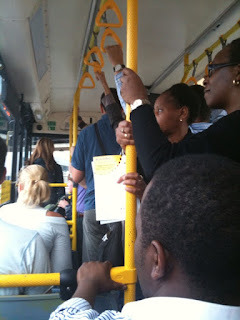 Check out this YouTube video: http://www.youtube.com/watch?v=hehPEoAk8eE. It will give you a good idea what the group sounds like, but it won't give you any idea whatsoever as to what one of their concerts feels like. To do that you have to be there, in person, as close to the stage as possible. And, if you have them, bring your love beads. This pub was voted by Hannah Davies as one of the best pubs in London. Had a drink there with Tommy Kinslow and soaked in the atmosphere. Nice. 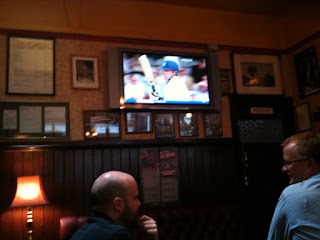 Unfortunately, the "best pub in London" had no chef that day, so we were forced to go elsewhere for food. 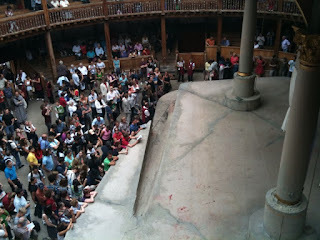 A view of a section of The Globe from the groundling's point of view. You were only allowed to take photographs prior to the beginning of the play. 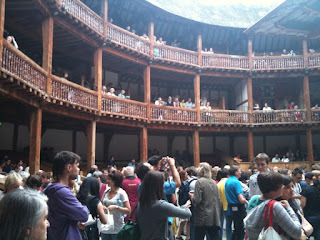 This is the view that we had of the Shakespearean play "Troilus and Cressida". It actually was a pretty good vantage point. We were right on top of the actors and could hear everything they were saying. Of course, the groundlings had a better view but I'm guessing that, by the third act, all they were thinking about was their aching back. Beautiful shot of St. Paul's in the background. Actually, a beautiful foreground shot as well!!! 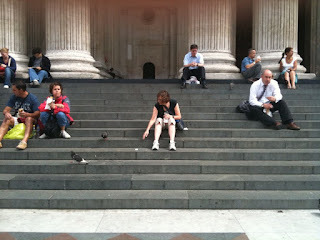 "Feed the birds, tuppence a bag ..."
Although Betty has been in England for decades, she remains Irish through and through. I wasn't in her house for more than 2 minutes before she had a beer in front of me and a cranberry and gin in front of Marilynn. Cheese and crackers and cakes and pate were also put out for us. Before we left for dinner, I was also "forced" to have a shot of poteen that was brewed in Ireland and which she saves for occasions just like this. I even got to drink it out of the ceremonial Mullen Family Reunion shot glass!! After a great dinner at a restaurant on the Thames, we returned to her house for -- you guessed it -- more snacks and two glasses of Irish Coffee. 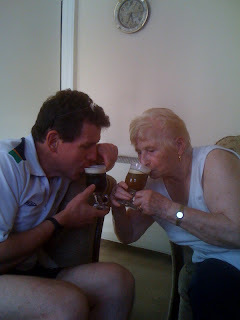 Let me just say that Betty doesn't make a weak Irish Coffee!! Unfortunately, I saw none of this. 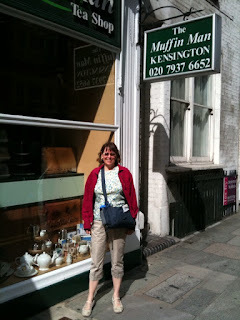 Marilynn walked all around Kensington Park this morning while I got my excercise fix at the gym attached to our hotel. Yes, walking is excellent exercise, but it doesn't get my pulse up high enough to count as a truly aerobic exercise. I'm sure you know who lived there, but only in fiction. Actually, even though the black door on the left has the address of "221b Baker Street", it's located closer to around 240 Baker Street. I guess they get away with it because it's not a real address. 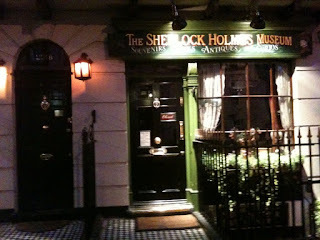 It might have been interesting to go inside the museum, but it was almost 8:30pm at the time and it was all closed up. Still, we weren't the only tourists taking photos at this time! Hallowed ground. You talk only in whispers ... I'm taking this photo through the bars of an iron fence that's on top of a 3 foot high concrete wall that's about 50 feet long. That wall is absolutely covered in color graffiti praising the Beatles. Yeah. It's lame. I know. But you'd do it too. There were a bunch of people of all ages hanging around waiting to do the same thing. 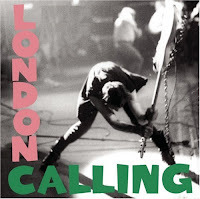 Apparently, quite a few people have been injured or killed emulating that famous album cover. Marilynn and I visited with Betty Cahalin for most of the day today. This photo was taken in a nice waterfront restaurant on the Thames right opposite the Millennium Dome. 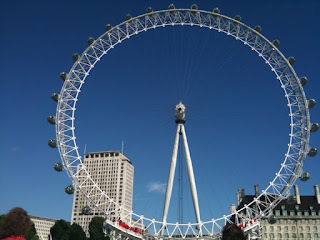 I was thinking of adding a picture of the Dome, but it has to be the ugliest structure in all of London. I'm absolutely stunned that my iPhone could capture this object with any degree of accuracy! 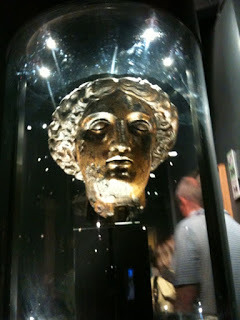 This is one of the prize relics -- recently discovered -- that's on display in the museum attached to the Roman Baths. 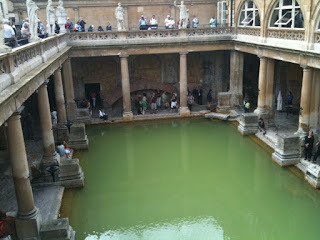 If I rememberer what I read correctly, this particular bath was in honor of the Roman gods. Humans weren't allowed to swim in it. That all changed, though, when the British reconstructed it in the 1800's. You're allowed to put your hand in the water (about 120 degrees) but they strongly advise against drinking it! 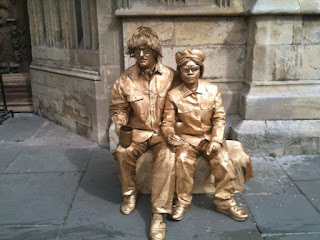 I'm thinking, "If I had to earn money as a street performer, what could I possibly do?" The answer is this. Paint myself and Marilynn gold, sit out at a street corner, and move slowly and in perfect unison. That's what these two did and had quite a crowd around them. I even dropped a few pence on them!! 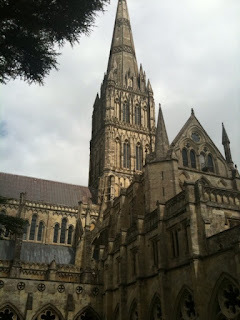 This cathedral must have been magnificent in its day. Today, though, it's in need of massive reconstruction due to the damage being caused by acid rain. Still, though, this portion of it is stunning. Other than to see one of 4 remaining copies of the Magna Carta (which I wasn't allowed to photograph), one of the main reasons I wanted to come to Salisbury Cathedral was to see this clock. It was made in 1386 and still works! 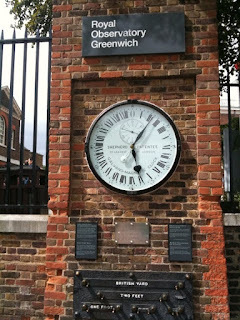 In fact, it's the oldest working clock in existence. Listen to the ticking — and Marilynn's faint narration — in the background. 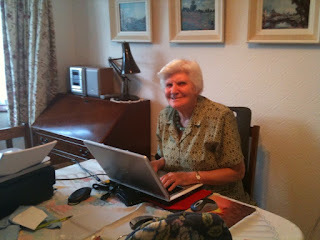 Think of Kathleen in this pose whenever you receive an email from her. Look closely ... she's even got an optical mouse! Standing, Left to Right: John Harrison, Patrick Mills, Brian Fowler. 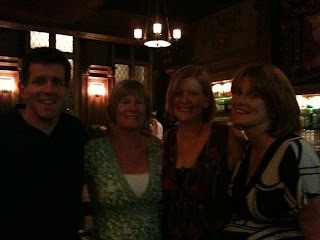 Seated, Left to Right: Me, Kathleen Duffy, Susan Harrison (Brian's daughter). 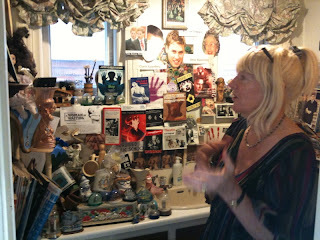 Notice that in the background is a framed copy of the Mullen Family Tree. We had an excellent day at Kathleen's. We talked for an hour, then went out to a restaurant and ate and drank for at least 3 hours before returning back to Kathleen's. Then, we talked for another couple of hours, looked at some classic old photos, had tea and cakes, and then finally dashed to the train station just in time to catch the 7:08pm train back to Kensington. Total fun, the entire day. It was a beautiful evening and the Thames riverfront was bustling! Marilynn and I tried to get there and catch the sunset from Waterloo Bridge but just missed. Actually, it was cloudy by then anyway, so we didn't miss much. 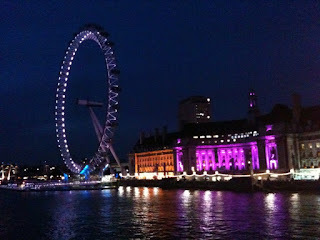 We ended up strolling up and down the southern side of the Thames, taking in the nightlife. It was packed with kids and street performers of all kinds. The Millennium Eye, inexplicably, was still packed. 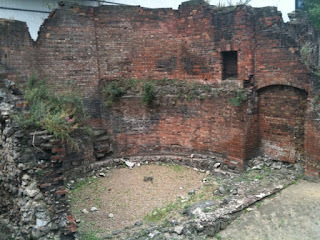 The photo above is from the opposite side of the river, giving you an idea of what it looked like. "Danger Mouse, Powerhouse!!" If you don't know what that means or why it has anything to do with this photo, email one of my kids and ask them. 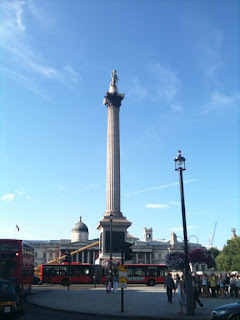 We spent a lot of time walking around London today. I have to admit to being dead tired by the time we got back to the hotel. The Millennium Eye is an incredibly huge ferris wheel of sorts that dominates the skyline around the historic Westminster area of London. 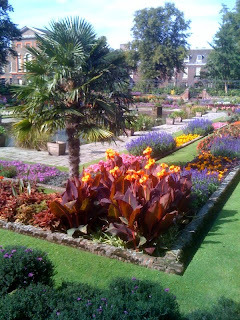 It's horribly out of place and most Londoners profess to hate it. Still, many of them admit that they've been on it. And, as the photo above proves, it's hard to resist taking a photo of it. It takes about 40 minutes to go completely around on the wheel. I can't think of anything less that I'd rather do. 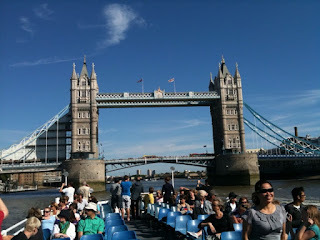 What a beautiful day for a cruise down the Thames! We boarded at Greenwich and floated down towards Westminster. 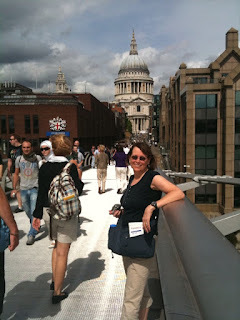 We had tremendous views of the many bridges that span the Thames, the Tower Bridge being the most spectacular. 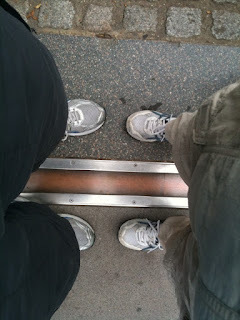 So, what you're looking at are my feet (on the left) and Marilynn's feet (on the right) as we straddle the Prime Meridian at the Royal Observatory in Greenwich. I know you have no idea what the Prime Meridian is, so I'll wait while you go look it up. 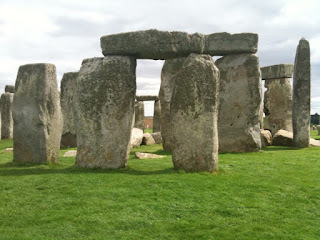 I included this photo to answer that nagging question: Just how big is the British yard??? 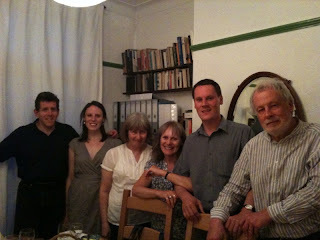 A fantastic day of eating, drinking and conversating at Dympna and Peter LeRasle's house in Woodford. 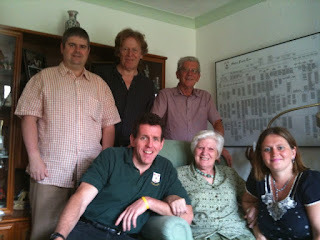 From left to right: Peter, Dympna, me, Maire Davies, John Davies, Huw Davies. Present (but not shown because I forgot to take a photo before they left) were Hannah Davies, Tom Davies (and his girlfriend), and Elinore Davies. 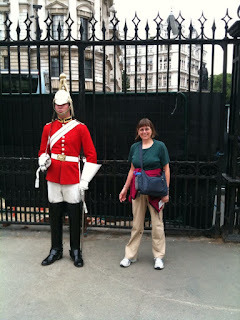 Getting the UK slant on Health Care. They are truly mystified on why the political right in the US is so violently opposed to it. They love their Health Care!! Showing off the Family Tree to those who hadn't seen it yet. Amazingly, Marilynn was able to work in a Library Story or two!! Marilynn was also introduced to Pimms, a fruity gin-based drink that is extremely popular in England during the summer months. Marilynn would end up ordering this drink at every bar we went to. Day 2: Dympna and her Amazing Bathroom! Left to Right: Tom Kinslow, Tommy Kinslow, Marilynn Mullen (barely visible ... nice job, Tommy), Mary Kinslow, Brendan Kinslow, Brian Kinslow. Excellent museum ... highly recommended. We spent about 2 hours there and we could have stayed longer. About 30 seconds of the parade on the Mall to Buckingham Palace as part of the Changing of the Guard ceremony. There's a fleeting shot of a Kinslow or two standing next to me as I film. Note carefully as I damn near get run over by a horse at the very end. 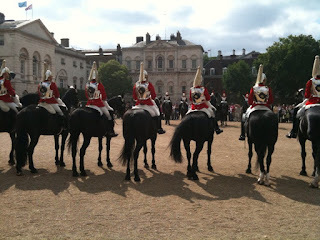 The above photo shows the beginning of the Changing of the Guard ceremony, starting at the Horse Guards Parade Ground. Two lines of mounted horses facing each other. After shouting something incomprehensible to each other, they all filed out and, accompanied by a marching band, made their way to Buckingham Palace. 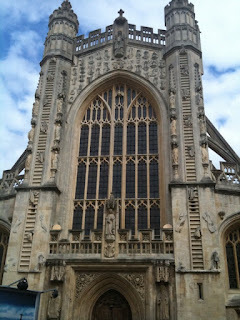 A truly amazing building that cannot possibly be captured in a photograph. I'm not even sure that this video does it justice. Day 1: Happy Hour in London! 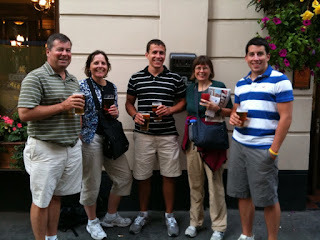 Met up with the Kinslow Krew after they got off of their Thames river cruise to Westminster. We headed immediately to a nice bar that Tom knew for Happy Hour. From there we went to a restaurant called Grumbly's (I think). Tommy Kinslow met us there as well. Left to Right: Tom Kinslow, Mary Kinslow, Brian Kinslow, Marilynn Mullen, Brendan Kinslow. Hey, wait a second.... What is that amber-colored substance in the glass that Brendan is holding?? 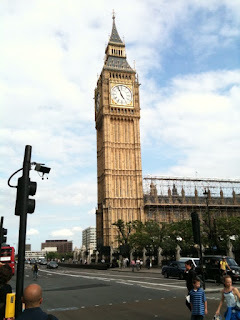 Everyone has seen photos of Big Ben. Well, here's another one. I'm here to tell you that it is incredible in person. This crappy iPhone picture doesn't come close to doing it justice. I might try to capture a video of it later when it is tolling the hour. Never managed to take that video. 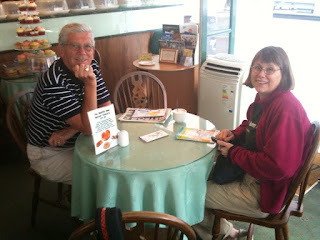 Brian Fowler and Marilynn eating breakfast at The Muffin Man in Kensington. 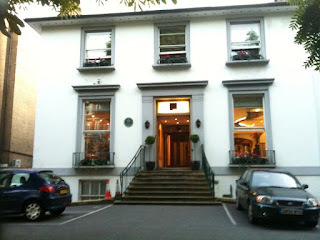 Brian couldn't have been more gracious, picking us up at Heathrow and driving us directly to our hotel in Kensington. And he even paid for breakfast!!! Our sight-seeing goals for the week include a visit to Stonehenge, viewing the Magna Carta at Salisbury Cathedral, a water taxi tour of the Thames, attending a performance of Shakespeare's "Troilus & Cressida" at The Globe, and checking out the Roman Baths in (where else?) Bath. It should be a fun albeit exhausting trip. I think Brian Fowler's comment to me in an email last week says it all: "Having seen your schedule I think you'll need a holiday when you get back!!" Got an idea for how this blog could be used? Got a topic that you think is blog-worthy? 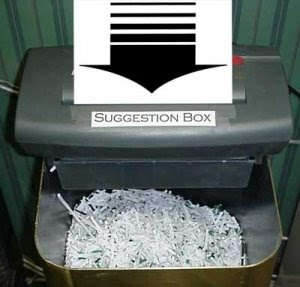 Add a comment to this post and the editors will give it the consideration it is due!! It would appear as though the only person who behaved properly in the entire Gates-Crowley incident was Lucia Whalen. In case you forgot, she's the neighbor who reported what she thought was an attempted break-in at a house on her block. I can only hope that my neighbors behave the same way if they see someone trying to break into my house! By most accounts, Professor Gates behaved poorly. Sure, he might have been tired; and I'm sure he was more than a little shocked to see a squadron of police cars outside of his house. Still, yelling at a cop in front of a bunch of other cops is never a very sensible thing to do. Even the most even-handed cop will get his back up a little. Officer Crowley doesn't fare much better than Professor Gates. At some point, it had to become vividly clear to him that the person he was arguing with was the lawful resident of the house. He also had to realize that this lawful resident had temporarily lost the ability to reason. At that point, he should have said, "Sorry to disturb you, sir," and walked out the door. Sadly, President Obama fares worse than either Crowley or Gates. At least they were caught up in the moment and could be forgiven their irrational behavior. 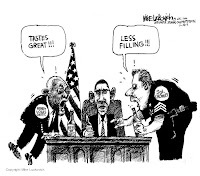 Obama had time to gather all of the facts, consult with experts, and think long and hard about what he should say. After all this, he concluded that the Cambridge police "acted stupidly". That's it. Nothing more. Even his most fervent supporters had to wince at that. What he should have said was something like, "This is not a racial incident. This is an simply an unfortunate situation that should never have escalated to where it is today. Both parties are guilty. Both parties should have handled it better." If he had said something like that and ended his press conference the entire blogosphere wouldn't be droning on about it today. Bad show, Mr. President. Finally, when things finally appeared to be calming down, Sgt. Leon Lashley, the black policeman who was also at Gates' home during the disturbance, wrote an open letter to Officer Crowley. In it, he asked Officer Crowley to inform Professor Gates and President Obama that Gates' actions "may have caused grave and potentially irreparable harm to the struggle for racial harmony". Please ..... does anyone really believe that? All his letter did was fan the embers back into flames and put this story back on the 24 hour news networks. The only positive thing about this incident is that it generated some excellent material for the late night comics and programs like The Daily Show. I particularly liked the political cartoon shown at the top of this post that was created by Mike Luckovich of the Atlanta Journal Constitution. Now that's journalism! This photo was taken at Keystone Park in Coney Island, NY, on July 13. It's a low-res iPhone photo, but no photo could possibly capture the ear-splitting guitar feedback that, in essence, WAS the Yo La Tengo concert. Dissapointing. 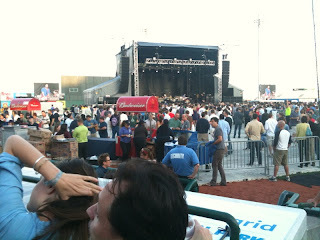 It's a good thing Wilco put on a magnificent show afterwards!